Crew 133 gets in touch with "Earth" during a simulated mission at the Mars Desert Research Station in rural Utah. Back row: Joseph Jessup, Matthieu Komorowski. Front row: Paula Crock, Gordon Gartrelle, Pedro Diaz-Rubin. HANKSVILLE, Utah – During the crew handover at the Mars Desert Research Station (MDRS) Jan. 4, one person spoke of the "noise" of Earth fading away as the crew focuses on its activities. That's something my group, Crew 133, is just starting to learn about. The Mars Society facility works to make the desert area as accurate a representation of the Red Planet as possible, and that particularly includes talking with people outside of the facility. That means the rest of the University of North Dakota-led crew and I mostly use e-mail to stay in touch with people. 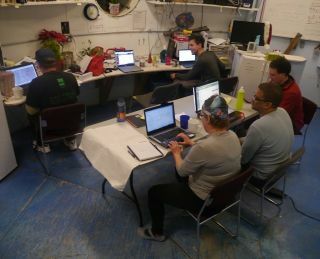 That includes a Mission Support team of dozens of volunteers that helps us plan our day and stay safe in a remote area. Every evening, my crew of six gathers to send reports on our day to this team, mainly talking to one capcom. Our window of communication with "Earth", as we call it, is between 7 p.m. and 9 p.m. Mountain Time every night. The first order of business is to send our daily reports on how the facility is functioning. The crew doctor sends a medical report; the engineering officer sends numbers indicating how different parts of the facility are functioning; and the commander talks about how the crew is doing overall. As crew journalist, I send a report talking about what we are doing in a way that would be accessible to the public, while most of the other reports are very technical. This is also a time for us to talk about problems with the MDRS habitat or the crew with an outside group. On our first night on comms (Jan. 4), there was discussion about remembering to change a furnace filter. And if a crewmember falls ill, responsibilities are adjusted. As each report is sent, the capcom sends back an "ACK" (or acknowledged) and may ask questions or add comments to get more information as needed. With our crew sitting around the big table, we bat around answers and relay the information back. For us, it's both a time to stay in touch with others and also a time to bond.